Happas held the lead until the board ran out [Qs][7c][6d][Ac][2s]. Pechie made two pair to win the pot and eliminate Happas in 3rd place for $17,108. The players in the $400 NLHE Deep Stack event are now in the money. 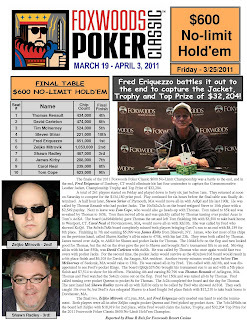 All 34 remaining players are guaranteed at least $957. The blinds are now 6,000-12,000 with a 1,500 ante and the average chip stack is just over 202,000. On a flop of [Js][9c][8s], Brad Noonan checked to Mehrdad Yousefzadeh, who moved all in. Noonan made the call and showed [Ah][Jc] to Yousefzadeh's [Ks][Jh]. The turn came the [4h] and the river was the [Ad]. Noonan won the pot to elimiante Mehrdad Yousefzadeh in 4th place for $13,720. Yousefzadeh had the lead until the flop came down [As][Jd][3d]. Rabin took the lead with a pair of aces. The turn came the [3c]. Before the river card came out, Yousefzadeh said "Do the right thing." to the dealer. He did just that by putting the [Kd] out. Yousefzadeh made trip kings to win the pot and eliminate Rabin in 5th place for $11,011. The board ran out [Jh][6h][6s][Jd][5d] and Pechie took the pot to eliminate Albilia in 6th place for $8,808. Luis Vazquez got his last few chips in the middle with [8h][8s] against Ariel Albilia's [Ac][7d]. The board ran out [Tc][9c][5c][Js][8d]. For just a moment, both Albilia and Vazquez thought that Vazquez had won the pot until the dealer announced straight and shipped the pot to Albilia. Luis Vazquez was eliminated in 7th place and takes home $7,283. The board ran out [Kh][Ks][2d][4s][Qh] and Pechie's aces held up to eliminate Pappas in 8th place for $6,098. The players in the $400 Deep Stack event are now on a one-hour dinner break. There are 99 players remaining and the average chip stack is just under 69,500. When play resumes, the blinds will be 1,200-2,400 with a 300 ante for another 23 minutes. The eight remaining players in the $1,500 Deep Stack event are currently on dinner break. Play will resume at 7pm with blinds at 6,000-12,000 with a 2,000 ante. The average chip stack is now just over 476,000. On a flop of [Th][6s][4d], Alfonso Cammarota bet just over 100,000 and Luis Vazquez moved all in. Cammarota made the call and turned over [Kd][Kh]. Vazquez was in bad shape with [Qh][Qs] until the [Qc] fell on the turn. The [3d] fell on the river and Vazquez raked in a big pot to eliminate Cammarota in 9th place for $5336. The board ran out [Kd][3d][2s][Jc][5c] and Vazquez won the pot to eliminate Smith in 10th place for $4,404. We are down to the final table of the $1,500 NLHE Deep Stack event. You can watch the live stream of the final table by clicking "Watch LIVE Video" at the top of the page. $1,500 Deep Stack In the Money! There are now only 15 players remaining in the $1,500 NLHE Deep Stack event. All players are now guaranteed at least $3,811. The average chip stack is now 254,000 with the blinds at 3,000-6,000 with a 500 ante. We had a total of 344 players in the $400 NLHE Deep Stack event. $1,500 Deep Stack Now Streaming Live! We are down to the final two tables of the $1,500 Deep Stack event. There are 19 players remaining and the average chip stack is just over 200,500. You can watch the live stream of the feature table including Luis Vasquez and Justin Pechie by clicking "Watch LIVE Video" at the top of the page. Heidi Alexander Goes Back to Back in the Ladies Event! After the four-way chop in the Ladies event, Heidi Alexander went on to win the trophy and leather jacket in addition to the $10,076 first place money. 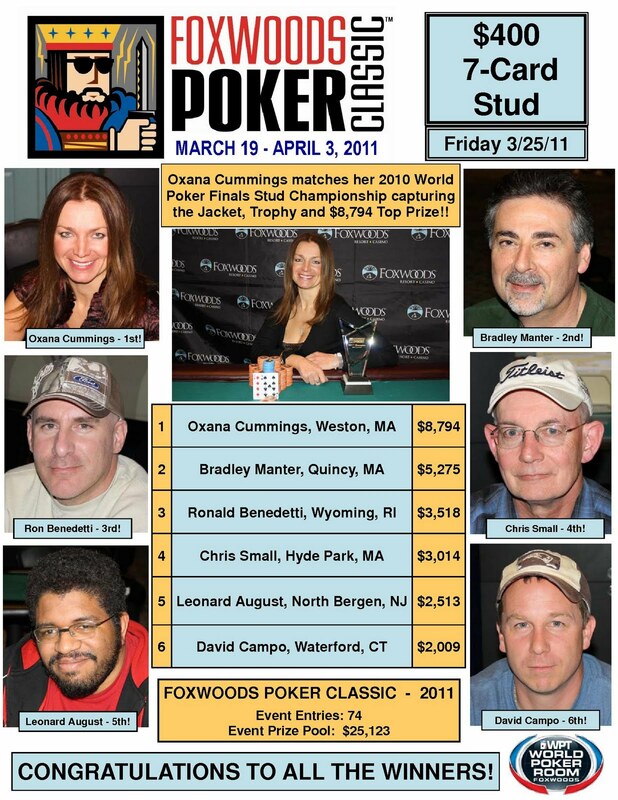 She has now won back to back Ladies events in the last two Foxwoods Poker Classic's. Four-Way Deal in the Ladies Event! 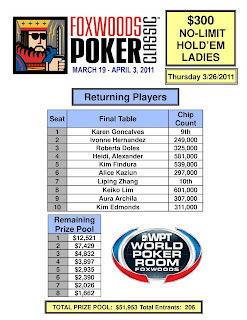 The final four players in the $300 Ladies event have agreed upon a four-way chop by chip counts. They are now playing out the tournament for the trophy and jacket. 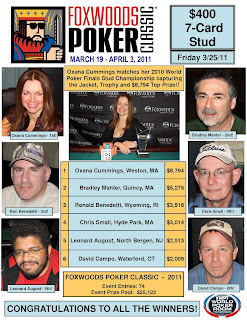 After Kim Findura raised to 120,000 before the flop, Kim Edmonds moved all in for 146,000 more. Findura made the call but her [Ad][2h] was dominated by Edmonds [Ac][5h]. However, the board came [Kc][8d][2s][6c][4h] and Findura paired her deuce to win the pot and eliminated Edmonds in 5th place for $2,935. Kim Findura just eliminated two players when her [As][Kc] held up against both Roberta Doles' [Ad][8s] and Keiko Lim's [Qc][Jh] after the board ran out [Ks][Qd][7s][6s][Kh]. Ivonne Hernandez has been eliminated in 8th place for $1,662 when her [Ts][9s] could not improve against the [Ks][Js] of Aura Archila. $1,500 Deep Stack Day 2 Underway! Day 2 of the $1,500 NLHE Deep Stack event is now underway. There are 29 players remaining with top 15 finishing in the money. The average chip stack is just over 131,000. We will be live streaming the $1,500 NLHE event at the conclusion of the Ladies final table. $300 Ladies Event Final Table Streaming Live! The final table of the $300 NLHE Ladies event at the Foxwoods Poker Classic is now streaming live. With eight players remaining, the average chip stack is just over 386,000. The blinds are currently 15,000-30,000 with a 4,000 ante. $400 Deep Stack Event Underway! Players are starting with 20,000 in chips and the levels are 40 minutes in length. The $1,500 NLHE Deep Stack event has ended for the night with 29 players remaining. Play will resume at noon and continue until we have a winner. 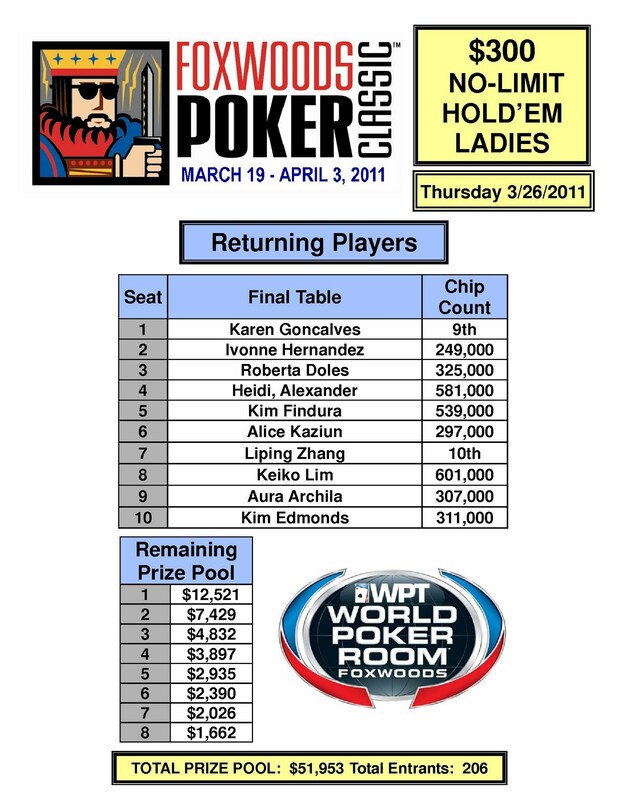 The $300 NLHE Ladies event has also concluded for the evening with eight players remaining. Play will also resume at noon. We will be live streaming the final table of the Ladies event followed by the final table of the $1,500 NLHE Deep Stack. Fred Eriquezzo has won the $600 NLHE Deep Stack event. He takes home the trophy, the leather jacket and $32,204. Just moments after heads-up play between Zeljko Mitrovik and Fred Eriquezzo began, they got all on their chips in the middle. Mitrovik held [Qd][Qh] but Eriquezzo flipped up [Ac][Ah]. The board ran out [7c][6c][2d][9h][8s] and Mitrovik was eliminated in 2nd place for $18,919. Shawn Rodley got his last few chips in with [Kd][Tc] and was called by Fred Eriquezzo with [Ad][Td]. The board ran out [Th][9h][6s][5h][9d] and Eriquezzo won the pot to eliminate Rodley in 3rd palce for $12,210. The turn was the [Jc] and the river came the [2h]. Eriquezzo won the pot to eliminate Renault in 4th place for $9,796. 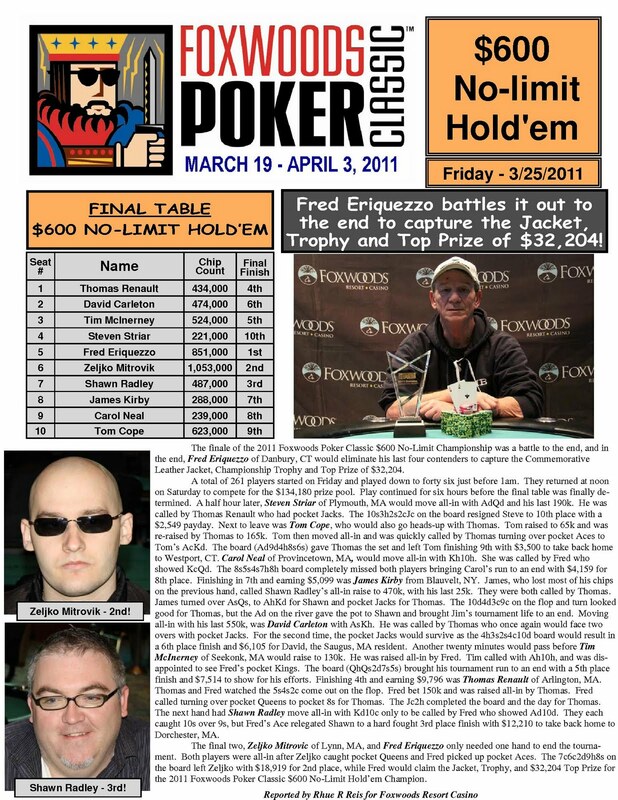 Eriquezzo now sits with nearly 3,500,000 chips. The board came [Qh][Qs][2d][7s][5s] and Eriquezzo won the pot to eliminate McInerney in 5th place for $7,514.